Roy Hartsfield, the first manager of the Toronto Blue Jays and former second baseman for the Boston Braves passed away January 15, 2011 in Ball Ground, GA. He was 85. Hartsfield played second base for the Braves from 1950-52 while maintaining a .273 batting average. He was traded after the 1952 season to the Brooklyn Dodgers for Andy Pafko. He would not return to the major leagues as a player after the trade. The rugged second sacker entered organized baseball in 1943, playing for the Atlanta Crackers before entering World War II. Hartsfield served in the Navy at the famed Great Lakes Naval Base. In a 2008 interview with Hartsfield, he described the baseball legends that awaited him at Great Lakes. "I played my first year in the Navy," he said. "I was the only minor league player on the ball club. All of the others were major leaguers. We had Virgil Trucks, Schoolboy Rowe, Clyde McCullough, and Billy Herman. We played a 50 game schedule, we won 48 and lost 2; I guess we did pretty good. Billy [Herman] helped me quite a bit with my fielding ability. He treated me very good. In fact, they all treated me like I was their son because I was so much younger than them. I was only 18 years old!" After a year, he was sent out to finish his service. He detailed his service upon leaving the Naval Base. "I spent 10 months riding a banana boat between Mobile, AL and Central America (Honduras and Guatemala). I was riding that boat when the war was over." After returning from his military service, he floated between Single-A and Double-A before catching a big break in 1949. He was signed by Braves organization from Dallas in the Texas League that year and had a standout season at their Triple-A affiliate in Milwaukee. "It was a little tougher, but probably that year, I had the best year in my life," Hartsfield said. That career year catapulted him to the major leagues the following spring. Hartsfield was the regular second baseman for the Boston Braves in 1950 and 1951. Looking at Hartsfield's stats, one might wonder how a second baseman who hit .273 suddenly disappeared from the majors without a downturn in performance. Hartsfield revealed why he didn't have a longer career with the Braves. "I had a severe case of heat exhaustion before I went to the big leagues. I played in a double header in Savannah, GA and I became completely dehydrated. I didn't realize what was happening to me. Nothing like that had happened to me ever before. They took me to the hospital like it was all over. The second game of a doubleheader was when it hit me, got cramps like football players. The doctor told my wife, 'He'll never be the same in the heat anymore.' And he was absolutely right. I couldn't play doubleheaders. I played as long as I could but then I had to walk off the field. I realized at the same time, I was losing the job. They didn't pay two salaries for one job in those days. I have nothing against the Braves, they did everything they could to help me, sent me to every doctor you could think of. That was the reason. I have a lot of people ask me to this day why I didn't play longer. They didn't know that because I didn't tell anyone that. It didn't come out until later on." Hartsfield would not return to the majors after being traded to the Dodgers, spending five seasons at the Triple-A level, including one as a player-manager before managing full time in 1958. He saw the writing on the wall after being traded away from Boston. "When I was traded from the Braves to the Dodgers, I knew I wasn't going to go back to the big leagues as a player because of my reputation of not being able to play in the heat," he said. "I knew that. I told my wife, 'If we're going to stay in this game we've got to go in another direction instead of playing.'" Luckily for Hartsfield, the Dodgers opened the door to managing that would make him part of the family. "They gave me my first managerial job," he said. "I was very appreciative of that. They treated me very very well. I was fortunate in that the Dodgers gave me a job managing to begin with. In those days, they had started losing teams every year. The first year I managed was Class-A ball in Des Moines. I was told by Fresco Thompson that he couldn't promise me anything past the first year, because they were losing clubs. They not only lost the team, the whole league folded up." For a 32-year-old, the prospect of being unemployed after spending their whole career in professional baseball was daunting. Hartsfield described how Fresco Thompson saved his career. "Here I am sitting in November without a job after my first year. My phone rang and it was Fresco. He said because of leagues folding, the only opening was in Class-D ball." Faced with the choice of a demotion or not knowing where the next check was going to come from, the choice was simplified for Hartsfield. "I realize there is more prestige in managing Class-A ball then Class-D ball, however, I told him, 'I've yet to go to the grocery store and buy any groceries with prestige, so just run it on out here and work.' I did that two times for him. I stepped down twice. He told me I would be considered if anything opened above. I moved every year until I got the top job, managing Spokane for three years before I got a job with the big club." True to his word, Thompson moved Hartsfield up the ladder where he joined the Los Angeles Dodgers as coach from 1969-1972. 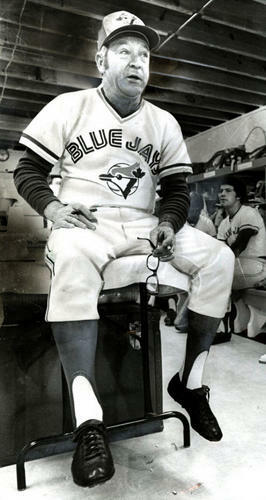 In 1977, he was named the manager of the expansion Toronto Blue Jays during their inaugural season. The Jays struggled with young talent as they matured at the major league level. Hartsfield knew that he would have to build from within as the other teams weren't going to make their top-level talent available in the expansion draft. "We developed our own because nobody was going to give you anything in this racket," he said. "We agreed to have the right type of veterans mentally that would fit into our scheme of things." While managing the Blue Jays, Hartsfield had a lanky rookie that would go on to have an All-Star career, albeit in another sport, basketball. Danny Ainge was a 20-year-old rookie out of Brigham Young University when he showed up for the Jays in 1979. Hartsfield had experience playing with another dual sports star, sharing the field with Hall of Famer Bill Sharman in St. Paul. Hartsfield related the situations of both Sharman and Ainge, as both chose basketball as their main careers. "Sharman was a pretty good player on the Triple-A level," he recalled. "At the time, I wasn't judging Bill because he was a good teammate and friend. He made the right decision [with basketball], same as Danny Ainge, who played for me in Toronto. When you have an expansion ball club, you don't have full fledged major leaguers at every position. Bobby Doerr was my hitting coach and he was the one who signed Danny. He told me when he signed that his sport was basketball. Bobby was right. Ainge was a fierce competitor. He could have used a few years on the minor league level that he did not have. Who knows, maybe it would have helped, maybe it wouldn't?" After being replaced as the Blue Jays manager to start the 1980 season, Hartsfield cited family responsibilities as the reason he retired after a short stint thereafter as a minor league manager. "I left Toronto and managed a few years in the minors," he said. "I was vested in the pension plan. I had 10 years on the major league level, so I didn't want to just manage for the sake of managing anywhere they offered me a job. I had a family that I didn't get to spend too much time with, so that determined my quitting." In retirement, Hartsfield didn't follow baseball as closely as he did when he was playing and managing. He would visit the Braves annually, where for a day; he was back in the spotlight. "Bobby Cox is a close personal friend of mine. The Braves invite me every year for an autograph session one night. They treat me royally and I get to visit with Bobby a little bit." Somewhere in Heaven, the red carpet has been rolled out and the spotlight again is on Roy Hartsfield. 13 stolen bases, the most on the Milwaukee squad.